Well, the results of the Food Blog Awards came out and (drum roll, please) ERR didn't win, but some wonderful blogs did! Congratulations are in order for Kalyn's Kitchen in the Best Theme category and for Pinch My Salt in the New Food Blog category. Thanks to all of you that voted for ERR, we made a darn good showing. I appreciate your show of support for me and for the Well Fed Network. You can see all the winners over at Well Fed. 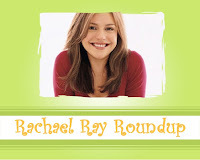 As usual, the blogosphere was interested in Rachael Ray this week. Here are the blog posts and news tidbits I found from around the web. If you write a post about Rachael Ray or see something you think is worthy of inclusion in the Roundup, please let me know by emailing me at everythingrachaelray at gmail dot com. Talk Show Ratings Update: Variety says that even though there were reruns all week, the show "drew its biggest audience ever, averaging more than 2.9 million viewers per show. The freshman champion jumped 10% for the week to a 2.3, matching skein's highest household rating to date." In case you missed it, the show was also picked up for a second season. Paula of the Cookbook Junkie tried her first Rachael Ray recipe, Hamburger and Onion Stuffed Bread, from Rachael Ray 365: No Repeats--A Year of Deliciously Different Dinners. She offers her thoughts on the recipes and on the cookbook. Gone Hollywood has some pictures of a taping of Rachael's talk show featuring Cheryl Hines from Curb Your Enthusiasm. The Pittsburgh Post predicts that Rachael Ray will be will be "the face of food TV" in 2007. Um, wasn't she the face of food TV in 2006? Foodie Obsessed includes Every Day with Rachael Ray among its Top 25 Gifts for Foodies. Amelie Gillete of The Hater over at The Onion's AV Club offers some in-depth analysis of The Every Day with Rachael Ray Fortune Teller. This is just plain odd. Here's some video from MSNBC's Joe Scarborough asking: "Is Rachel Ray causing trouble in Oprah and Gayle's relationship?" He interviewed Star Magazine's David Caplan and Life and Style Weekly's Dawn Yanek to find out the answer. Slow news day? Rachael Ray is attending the black tie 2007 Charity Preview of the North American International Auto Show tonight. I'll keep an eye out for any pictures! A new addition to the Roundup this week is Daily Unadventures in Cooking. How have I not found Katerina's blog before? She took something she saw Rachael Ray do, combining lemon and spinach, and created Tortellini in Brodo. She even made her own chicken stock for it! Very impressive. Jeffrey Dean Morgan (most recently Denny from Grey's Anatomy, Supernatural, Weeds) has a big fan club out there. They are talking about his appearance next week on Rachael Ray's talk show. Alison of the Blue Blog created a fun activity for herself and her kids - making Rachael Ray's candy sushi recipe. Total props for getting nominated! Kalyn - from your lips to God's ears! Thanks for including me! I quite like your blog, and I do love Rachael Ray! YOu are welcome, Katerina. Your blog is a treat!